Could this happen to you too? Nobody is safe. Sharon Armstrong had lived an exemplary life. She came from a supportive whānau, who taught her sound and sensible values. A solo mother, she had successfully brought up her daughter, had been employed in senior roles in government institutions, and had even trained and worked as a probation officer. She never expected that one day she would be fighting for her freedom in an Argentinian jail – and being condemned as a drug mule by the media in her homeland. Sharon’s story as to how she got there, how she survived and how she resurrected her life is both enthralling and educational for all of us and especially for those who live in the false belief it will never happen to me. One would think that the turgid monotony of prison life would be an unlikely habitat for hope to grow. We observe Sharon Armstrong counting the minutes of phone calls, the numbers of cockroaches infesting the cells, or the amount of handles stuck onto brown paper bags. Hours are punctuated by gossip; washing floors and waiting for dinner to arrive. Only court appearances seem to break the routine. And yet as every day becomes one day closer on the makeshift calendar on her prison wall, we come to appreciate that hope, faith and whānau are a compelling reason for Sharon’s unwavering optimism. ‘Organised Deception’ paints a credible context from which to understand the craft of the ‘Romance Scammer’ and its traumatic consequences for the unsuspecting victim. Alongside the journal of life inside the walls of Unidad 31, we read the viewpoints of specialists in cyber-crime; in digital forensics, in drug mules and psychological manipulation. Organised Deception is however much more than a mere chronicle of prison days. It is a cautionary tale to warn off potential victims from being preyed upon by sophisticated networks of scammers, who feast upon vulnerability as a way of life. The journey to hell is documented not just by Sharon and her family members but also those who can analyse the psychological techniques used to entrap her into the clutches of the supposed “love of her life”. Ultimately, however, the greatest aspect of Organised Deception is that it is a love story of extraordinary contrasts. There is no doubt that Sharon fell in love for a person who captured her into a sticky web of false identity, fraud, debt, drugs and finally incarceration. One of the most tragic parts of the story is reading Sharon’s letter of loss and humiliation as she wakes to the realisation that she had been duped by someone she wanted to have complete trust in. To cope with her confinement behind bars, Sharon reaches out with relentless positivity, befriending women despite language barriers or differences of age and lifestyle. She finds joy in cleaning the walls with them, learning Spanish and sharing stories of the children and families waiting for their loved one to return home. For if there was ever a parable for the modern day, it would be that for Sharon every waking moment of every interminable day is only able to be borne because of the all encompassing love she has for her whānau. They inspire her to stay strong; to keep resolutely focussed on coming home, and never ever to lose sight of the value she represents as a grandmother, a mother, a sister, an aunty. The potent message of Organised Deception is that the only power capable of unravelling the psychological knot into which Sharon’s life becomes twisted, is a solution of her own making. Her whānau never lose hope, they encourage her to be healthy, to focus on life when she comes home. And in return Sharon’s story ends as a radiant triumph of hope over harm, faith over fragility. She issues a defiant challenge to anyone else who may fall victim to an unsuspecting predator: “please remember it is not a crime to fall in love – it is where that love may lead you that is the concern”. In her case, love wins out. She is resolute in her determination that the crime for which she is accused will not define her future. In this respect the book moves from being a biographical documentary of life beyond bars to almost emerge as a self-help guide to well-being – no matter what. 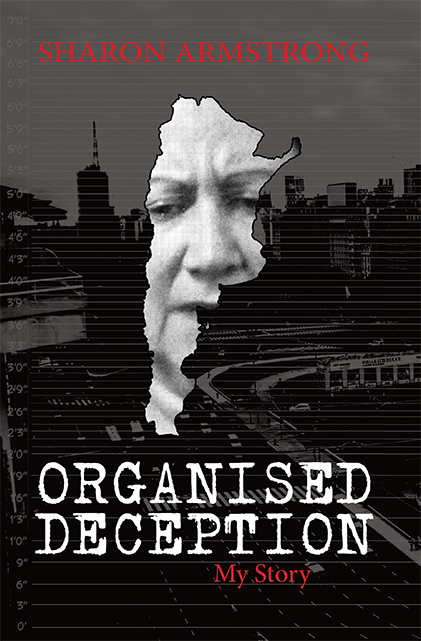 ‘Organised Deception’ is worth reading on that score alone – that even in the most dire of circumstances, whānau can be the key to survival. This all enduring sense of faith, of hope and of belief in the power of whānau is what makes Sharon’s story so powerful. This book is a powerful story about how someone can innocently get caught up in something so serious. I felt immersed with Sharon through the dark tunnel of her journey and shared the happiness she found within herself, those surrounding her in prison and her family. Sharon connects, collects and embraces positive experiences and faces, embraces and processes negative experiences positively. A genuine insight in to the life of an unwitting drug mule and the reasons that allowed her to become one. It is such a powerful story and yet in all the horrible situations you found yourself, you claimed the strength as a loved family member. I so admire how you found positive sides to many of the horrors, kept your dignity (even though you didn’t feel it), by making so much good come from your story. It was good, but hard to read, the tough situations that seemed to continually try and pull you down…don’t know how many of us could have coped without completely losing it. I admire how much you felt able to help others who were caught up in that foreign system. How frustrating having to deal with all the interpretation stuff, it would worry you that they were saying stuff you thought was wrong. Anyway dear, the admiration and love I have had for you before, has grown even more, seeing the wonderful strong lady you are now, and the commitment you have made to try and prevent any other person and/or family from experiencing such heartbreak. Sending so much love to you, Ari and Leanne and other loved ones. This book is an eye-opener into the sordid underworld of internet scamming and it’s devastating effects. These criminals know what they’re doing. By targeting people at vulnerable times in their lives and methodically and patiently building trust and a false love, they risk innocent lives and freedom in the most callous of ways. This is modern day scamming and the fact that a smart, savvy woman like Sharon can fall victim means it could happen to almost anyone. How she survived the horror of this ordeal and prison life is testament to her character. Read this book because we all need to understand the dangers and consequences of the internet scamming scourge.